Since it was dark before I was finished shoveling, I’ll just re-use an old picture of the unbroken snow where there was supposed to be a road. “Think of it as negative calories” said the voice in my head, or perhaps it was me. Anyway, it snowed when I got up in the morning, and it kept snowing practically to the end of the workday. Â So when I came home, I had some work to do with my aluminum spade. Â And I did it. Â I re-opened the path from the house to the neighbor’s road (the plow has never returned after the one time it saved us from death by washing machine) and I made the path twice as wide while I was at it. Â Of course, if we get one windy night, it may all be lost, because it crosses a wide open field where the north wind has all the time it wants to build up speed and pick up snow to put in my path. Â But for now, I am content. Â Think of it as negative calories. Anyway, I guess I lost some calories shoveling, but at least I did not lose my lunch. Although the thought did visit me, as I have been not-quite-queasy all afternoon and evening. Â I don’t think this is related to the pain in my lower right side, right inside the hip bone. Â Shoveling snow and feeling that pain each time I straightened up, I vividly remembered feeling the exact same pain when I was widening the exact same path the week before I moved in. Â So, around 3 weeks ago. Â It wasn’t there all the time though, it came back this morning or during the night. Â Not typical of appendicitis to appear randomly like that, I think. Â Besides, with appendicitis you get sick first and the pain moves from all over to settle in the side. Â Well, there are exceptions. There are also people who get hit by meteors. Â I hope I fall in neither of these categories. In fact, I hope not to fall at all for a long while. Â At least not by the wayside. Â Falling in temptation – well, I don’t hope for that either really. Â It has been known to happen though, somewhat depending on how harmless the temptation seems. Today, for instance, I bought a pastry (Danish-style) for a late lunch, even though such things are absolutely soaked in fat, and you know I get violently sick from eating more than a little fat. That is why I can lose weight so easily and spend so long putting it back on, although it does return eventually. Â Well, I did not fall all the way to the bottom of this temptation, I only ate half of it. Â My vague feeling of being over-fed is just as likely to come from the Pepsi I had for brunch, or even the sweetened fruit yogurt. Â I have been feeding myself a lot of sugar lately, and I feel that way too. In happier news (if we can get happier than negative calories), it has been mild the last couple days – only a couple degrees below freezing. Â I guess it says something about this winter that this really feels mild. Â I don’t go outside in my shirt exactly, but I can easily keep the house warm in this weather. That is a wonderful feeling, after having had to sit with a thermo jacket in the home office, and being roasted on one side and frozen on the other in the living room where I have kept the wood stove burning. Â It still burns, but now the whole room is pleasantly warm. And not just the room. Â The fan in the heat pump is blowing through the home office (but I sit to the side of the jet stream) and through the small outer hallway into the living room. Â The living room is open to the kitchen, and I have the door open from the kitchen to the inner hallway, and from there to the bathroom and from there to the washing room. The inner hallway also contains the stairs to the upper floor, so the warm air rises up there on its own. 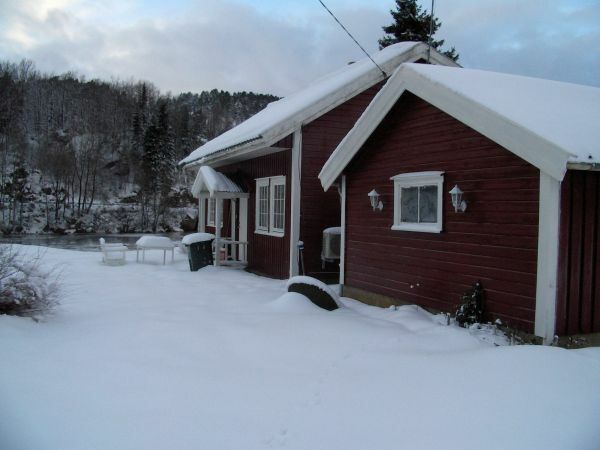 That way, the whole house is covered with just the heat pump and the wood stove. Â Well, and a small radiator in the bed room, though I would not have needed it if I liked to sleep cold like most people do. I still have some calories to burn on unpacking, as things are standing in bags and boxes all over the place still. Â The truth is that many of them stood in bags and boxes before too, except many of the bags and boxes were inside the deep cupboards I had there but don’t have here. Â I intend to take the content from some of them and simply get rid of it without ever finding a place for it. Â If I live long enough, which I sincerely hope. Keep watching this space to see if I’m still around!